We use an Adler Narrative with a constructionist approach for young adults, adults, and those addicted to substances. Narratives chronicle experiences that reveal a sense of "who" they have always been before life's stressors got in the way. It allows them to co-construct pathways that project their giftedness in the world. This subjective inventory is designed to amplify the purpose or context of "why" intentional change is necessary to fulfill purpose-driven goals, which lead to a new way of living. This inventory analyses interest patterns to assign a Holland occupational code that individuals use to correlate with their Narrative assessment's life themes. This process allows them to validate the efficacy of their individual preferences helping each person discern their “role in life.” Holland Worksheets then offer descriptors to refine their search with extensive information on each occupation. This professional personality inventory is used to uncover character traits offering an in-depth profile of one's personal style, strengths and blind spots. It is especially useful in identifying how careers fit with work settings, as well as providing guidance self-management to stem workplace conflicts. ​The Highlands Ability Battery (tHAB) objectively measures your abilities (what’s you’re naturally good at). These may be enhanced through learning, practice and experience revealing how these inborn strengths can support careers of interest. ​The Legal Career Aptitudes Program interprets and validates your tHAB scores and ability patterns to guide you to appropriate and specific areas of law practice in which you will excel and enjoy. ​Our Leadership Report offers adults an in-depth understanding of how their natural abilities can be channeled to increase job satisfaction. It is designed to provide insight into how best to fine tune blind spots that enhances job performance. ​The California Psychological Inventory (CPI™) 434 assessment is a powerful leadership development and selection tool that helps individuals and leaders improve their performance by giving them insights into their work-related characteristics, motivations, thinking styles and interpersonal relationships. ​The California Psychological Inventory (CPI™) 260 Assessment for leaders ​is a more streamlined version of the CPI​ 424 that contains 260 items selected from the full 434-item assessment. 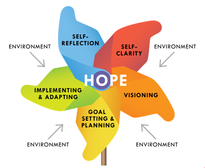 ​The Hope-Centered Career Inventory (HCCI) is an innovative instrument designed by Yoon, Niles & Amundson (2011) based on the HCMCD model. It measures levels of Hope as essential competencies for coping with life and career flow challenges. Career flow refers to the wide range of positive and negative experiences that we encounter at work on a daily basis. The College Student Inventory identifies the leading non-cognitive indicators of students’ success. It is the leading tool for early identification and early intervention for students college bound. A world-leading assessment tool designed for business students and professionals who want to understand how their abilities and interests define their pathway in the business world. The Thomas-Kilmann Conflict Mode Instrument TKI®) tool is the world's best tool for helping people understand how different conflict-handling styles affect interpersonal and group dynamics empowering them to choose the appropriate style for any situation. It assesses individual's behaviors in conflict along with two dimensions: assertiveness and cooperativeness detailing how the individual can effectively use five divergent conflict-handling modes or styles.